Even if you have only a small budget to spend on the wedding centerpieces for your reception, it doesn't mean that you have to compromise on style. These cheap wedding centerpieces look much more expensive than they actually are. These ideas will help you come up with a centerpiece that will have your guests talking about just how stunning they are. Besides being inexpensive, these projects are also easy and quick to put together, giving you more time for other wedding tasks. These flower and sand centerpieces are simply gorgeous and would bring both simplicity and romance to your reception. Fresh flowers are used in this DIY project, but you could just as easily use faux flowers. This budget wedding centerpiece uses candle holders and books to make these standout topiaries that will bring on all the compliments. Add some whimsy to your reception by adding a vase or jar full of paper pinwheels. You can easily get paper in your wedding colors or even go with a classic white or silver. Put a wedding table number beside it and you've got a complete table. If you know someone handy, these wooden lanterns are an easy and quick woodworking project. There are free plans for 4 sizes, giving you all kinds of options. You can pick up potted plants for only a few dollars each. This DIY project shows you how to take a simple paper bag and some twill tape to elevate those dollar-store pots. Mason jars are a popular item to use at wedding receptions, and this DIY project will really dress them up. All you need is some glue and glitter to make them sparkle. Here's a unique wedding centerpiece that uses citrus as a vase for flowers. Use a grapefruit or orange and the smell of citrus and floral will surround your guests as they enjoy your wedding reception. Paper is inexpensive but when you add some beautiful papercuts and insert an LED candle, they make magical lanterns. You really can let your imagination run wild with these, choosing specific colors and designs to match your style. Simple can be stunning and this faux peony arrangement proves that. With a vase, acrylic water, and some faux peonies, you'll have a simple centerpiece in minutes. Vases are used in a lot of wedding centerpieces but are usually pretty boring themselves. Using origami, you can make this beautiful and unique vase out of paper! Your guests won't be able to quit admiring your handiwork. This budget wedding centerpiece is a unique one that we bet your guests haven't seen before. Collect some branches and use some paper feathers to adorn them. Add a few or go crazy like in the photo. If you're having a fall wedding, a stack of these faux pumpkins from a dollar store or craft store makes an easy and affordable centerpiece. Here they've been painted to create a farmhouse look. Succulents make a great wedding centerpiece and if you doll them up with some Kraft paper tags, flags, and banners, they will really add some personality. They can even double as an easy wedding favor. Here's another way to create your own unique vase, this time using wine corks. Stack them in different heights and widths to really add some interest to your reception tables. Vase fillers are common in wedding centerpieces, but these are a surprising one! Transform dried beans when you spray paint them into a unique and stunning vase filler. Give your wedding an Anthropologie vibe with these faux galvanized zinc vases. It's a very cheap wedding centerpiece because all it uses is paint and cardboard. Instead of fresh flowers, consider making some paper flowers to use as a frugal wedding centerpiece. Using any color of crepe paper you'd like, you can make these beautiful flowers that you can enjoy for years to come. If you're getting married in the winter, these holiday floating candles would make a great wedding centerpiece. Simply add some greenery and berries to a small vase of water. 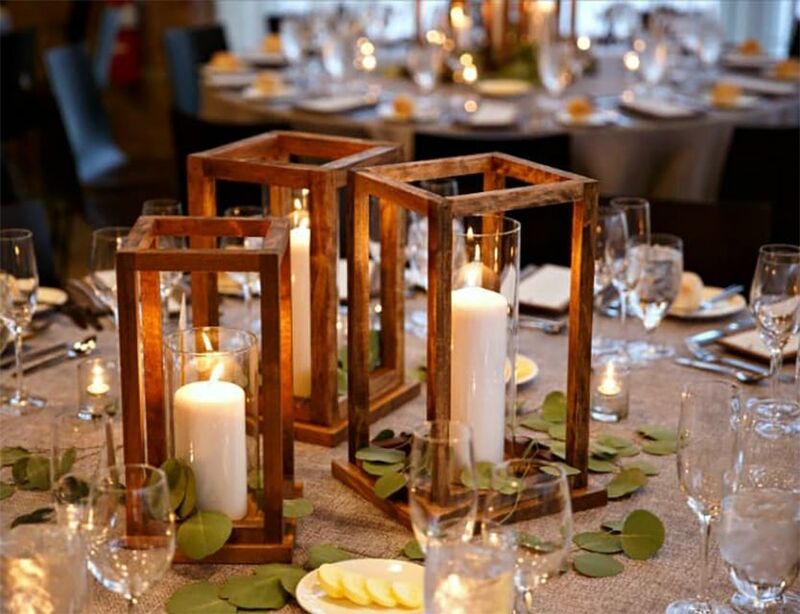 Add a floating candle to the top and have them lit right before the guests arrive. This mason jar DIY project has you glue faux beach glass around a mason jar and then tie it with a twine bow. These water lilies aren't really meant for the water because they're made out of crepe paper. Just a few of these scattered on the reception tables will really add some romantic pops of color. Use those vases for something other than flowers or candles with this Sand Art Terrarium project. Different colors of sand are used as a base for greenery you add on top.